CommanderOne® is the latest innovation that allows you to connect with your most critical asset anytime, anyplace. 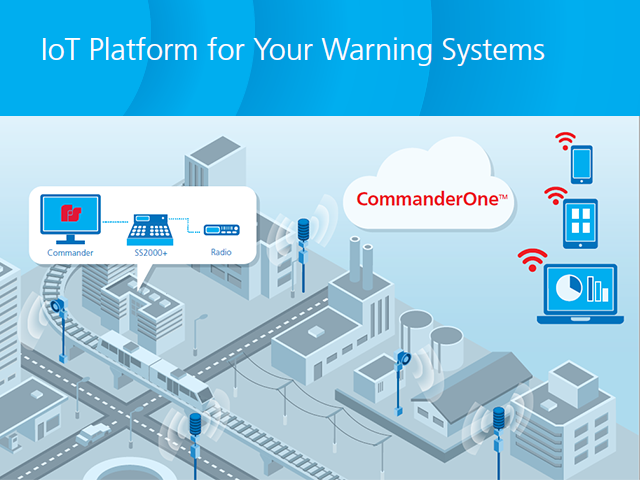 The CommanderOne cloud-based platform enables you to monitor and control your warning sirens from any desktop or mobile device. It offers real-time data with actionable insights, enabling you to make important decisions quickly. We understand that replacing a legacy infrastructure with new smart devices may be cost prohibitive, CommanderOne leverages your existing Federal Signal warning system and makes it smarter. With its simple dashboard and intuitive interface, CommanderOne is designed to make your mission successful in critical moments. CommanderOne is easily integrated with your existing Commander On-premise system. CommanderOne communicates with your system through a secure network communications interface. As changes occur with the On-Premise system those changes set up on the cloud-based control system. Siren activation and monitoring can occur from anywhere from virtually any device. The map interface provides status indications with manual activations or user-defined polygons. Automatic or semi-automatic weather based polygons siren activation is available for all CommanderOne users. User Experience - The Intuitive Interface is simple to setup, always up-to-date, and connects to your on-premise Commander control system. Map-based Activation - Location of sirens and their status is critical. Use the geo-intelligent interface to see a overview of your system. Desktop Freedom - Access your system from any computer connected to the internet. Mobile - A user-friendly app for iOS and Android. It has a web-based console with a mobile responsive GUI. Security - We understand that security is your top priority. CommanderOne utilizes IPSEC over SSL with a multilayered authentication mechanism. Weather Activation - All CommanderOne systems will have access to activate sirens based on weather-based polygons. Auto-Sync Hotkeys - No need to keep multiple locations synchronized, your hotkey activation settings are automatically created in CommanderOne. Scalability - CommanderOne platform is scalable from a few devices to thousands of devices. It leverages a global network of data centers to maintain availability while securing your data. Don't hesitate, get this new innovative app today and let us show you the next generation of Command and Control. Contact us for more information today! Commander (SFCDWARE) version 14.6 or greater. Static IP address assigned to on-premises Commander CCU/CCUs.